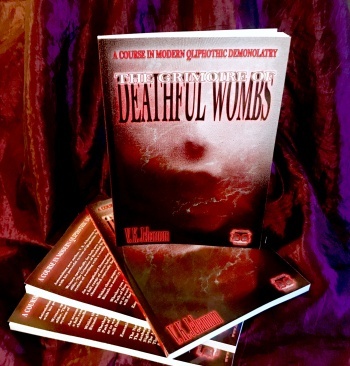 Astonishing new author, V. K. Jehannum makes his debut in print with his powerful system of Qliphothic Demonolatry. Written specifically for both new and experienced Demonolators alike, The Grimoire of Deathful Wombs comprises a completely new system of working with a wealth of powerful Nightside Spirits. An accomplished Demonolator, Jehannum guides the student through a full range of never-before-seen Rites and Invocations created and channelled especially for this groundbreaking book. Within these pages, you will find DEVASTATINGLY powerful Rituals to assist you in accomplishing whatever your heart desires. Whether you are seeking to align your Magickal Practices to the Path of Demonolatry, using the Adoration of the Black Moon Rite, or to work with a specific set of Demons upon particular issues, you will find your needs equally well catered-for within this Grimoire.